Job responsibilities are top study the relationship between organisms and their environment. This application is being used more and more in pharmaceuticals and their development, explaining the rapid demand and growth in the field. Biological Technicians assist medical scientists in conducting new drug tests, however, only requires a bachelor’s degree, as opposed to a PhD for medical scientists. 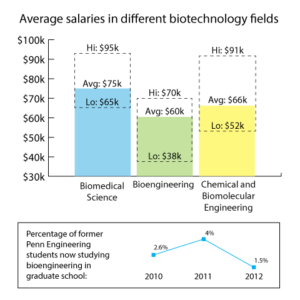 Yet, as the demand for medical scientists grows, so to will Biological Technician demand. Biomedical engineering is simply applying engineering principles to medical and biological problems. Biomedical engineers work in universities, hospitals, and various institutions to find ways to increase patient care and effectiveness. This is one of the highest paying jobs on our list for those that only require a bachelor’s degree. Operators are in charge of manufacturing, packaging, and shipping finished products depending on each companies specifications. Quality assurance and responsibility over what is shipped from processing plants also lies under this job title. Chemical Technicians specialize in using instruments and techniques that assist biomedical engineers and chemists conduct testing. Only requiring an Associate’s degree, entrance into the chemical technician field is practical, and worth the time. The main responsibility for epidemiologists is to identify and study the patterns of diseases and unhealthy trends among humans. Studying large samples, epidemiologists look for solutions and preventions of unhealthy patterns and look for ways to decrease them. Medical & Clinical lab technologists & Technicians are responsible for collecting and testing body samples (fluids, tissue, etc.). As the population continues to age, testing for diabetes, cancer, and other ailments will continue to increase, rapidly increasing the demand for lab technologists & Technicians. In short, medical scientists develop and test new drugs aimed at improving human health. According to the BLS, increased demand for medical scientists is being fueled by: A growing reliance on pharmaceuticals, a larger aging population, as well as a greater understanding of biological processes. Process development scientists oversee the processes associated with product manufacturing and development. Demand is increasing in the pharmaceutical industry as it continues to grow and require process overview. Biomanufacturing specialists oversee the entirety of project operations to ensure all requirements are met and process are operating properly. Ultimately oversees that new products make it to market.